I can NOT get enough of this LF Store dress. I keep going to their facebook page just to stare at this dress. I promised myself that I would go after work on Friday to my local LF store to check it out or to even see if they have it. This might help with my crazy obsession over this dress over make it worst. I can not begin to tell you how I can't stop thinking about it. Sick. I know. Fruity fruit....fruit. First Stella McCartney gives us fruity playful dresses and now Jeffrey Campbell is rocking the fruit. These shoes are SUPER playful. The colors really speak tropical vacation! 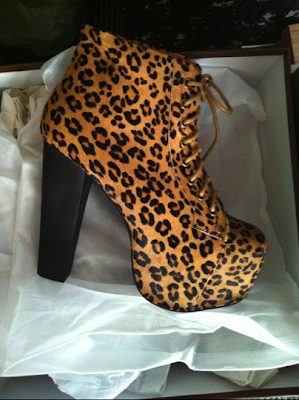 Once again Jeffrey Campbell....Solestruck posted these bad boys on their facebook page and I basically peed my pants. My two favorite things in one awesome package: JC and leopard print! I think I'll have to jump on the JC bandwagon! So many great shoes being posted by bloggers and I never heard of him! Those leopard heels look amazing! JC's consistently blow my mind. the fruity pair are just wonderful! leopard is just classic.